Handcrafted and woven bamboo strip utility burden basket with head strap band for hands free carrying. Usually used by village women and children for carrying items from the market. From the Isaan culture. 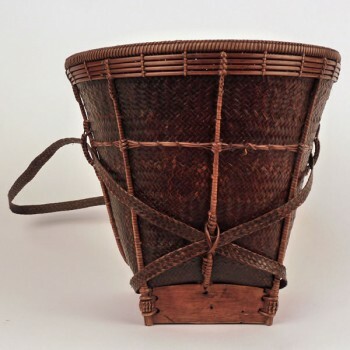 Isaan region of the Mekong Valley, Laos, vintage, 12" diameter x 11½" tall.